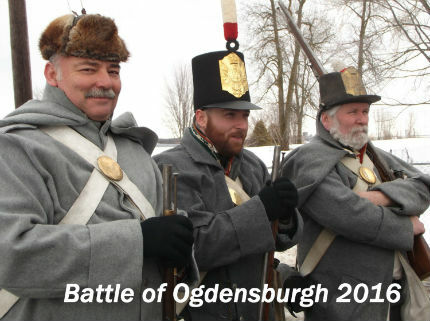 When February rolls along, the Incorporated Militia of Upper Canada can count on an invitation from Forsythe’s Rifles to again participate in the Battle of Ogdensburgh! This year was no exception, with our IMUC expeditionary force once again camping out in and helping to raid the town of Ogdensburgh. We have been able to glean a few pictures from Facebook c/o Silvia Pecota, and Bill Longo. Thanks to Dana Denhoff’ &Forsythe’s Rifles for giving a US perspective!